One of five species in the family Gaviidae, the ancestral roots of common loons can be traced back over 100 million years. They are goose-sized, long-bodied water birds with stout, sharp beaks. Breeding adults (males and females) have black heads and necks with a “necklace” of black and white stripes, black and white checked back and wings and a white breast. Immature birds and wintering adults have gray backs with a white breast. Their red eyes may help with underwater vision. Averaging around nine pounds, loons reach nearly three feet in length with a five foot wingspan. Common loons are best known for their almost violent mating dances and eerie wails that make them symbolic of our wild northern lakes and marshes. Since their webbed feet are located at the back of their bodies, instead of underneath, common loons are unable to walk on land or take-off from land, but are extremely powerful swimmers and very skillful at catching their diet of fish, frogs, crayfish, leeches and aquatic insects. They are able to dive to 200 feet, for up to five minutes, although an average dive is only one minute in length. Unlike most birds that have hollow bones, common loons have solid bones which reduce their buoyancy. When they compress their feathers, and force the air from their lungs, loons are able to move through the water with only their heads showing above the surface. Dense bones, however, do not keep loons from moving quickly through the air. As they fly, their wings beat 250 times per minute, propelling them to speeds greater than 80 miles per hour. Common loons are known to breed throughout northern North America and northern Europe, a range that generally equates to the extent of boreal coniferous and northern hardwood forests. Their breeding habitat consists of inland lakes that have an abundant population of fish and a large proportion of undeveloped shoreline. They prefer lakes with a small island or bog mat to hold the nest (inaccessible to raccoons and other egg-eating predators), in an area of little or no high speed boat traffic. Michigan residents begin to see these loons as soon as the ice melts from inland lakes, usually late March or April. Nesting begins in early May, often using the same nest used in previous years. Loons require undisturbed habitat, and are very sensitive to human activity while nesting or rearing young. The nest itself consists of a heaped up pile of vegetation and mud with a shallow depression to hold the one or two (rarely three) olive-colored, black-blotched eggs. The nest must be within one yard of water deep enough in which to dive. They frequently build on small islands, muskrat lodges, or forested shores. Following 28-30 days of incubation, a duty shared by the male and female, blackish, downy chicks are hatched, and can swim almost immediately, although for the first two weeks, they may catch a ride on their parents’ backs. Within six weeks or so, the surviving chicks will have grown to the same size as their parents, and will be able to fly, however only one out of every four hatched makes it to this stage; most chicks are lost to large turtles, predatory fish, hawks and eagles. Adult and immature common loons return to their wintering areas on the Gulf of Mexico and Atlantic Coast from September to December. The young may not return north to breed until they are two or three years old. Historical numbers of common loons in Michigan are not known, however, it is known that they were common in most regions, and bred in every county. By 1912, it had already been noted that common loons were no longer as common in the more heavily settled areas of southern Michigan. The Michigan population was down to around 200 pairs in the early 1980s, but recovered slightly to 300 pairs by the end of the 1980s. These numbers are very low compared to what the historical populations are believed to have been. 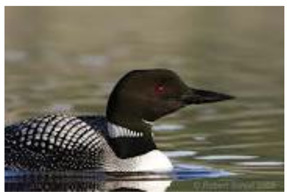 They are also low compared to the estimates of common loon populations in other Great Lakes states with estimates the mid-1980s for Wisconsin and Minnesota 2,300 and 10,000 birds respectively. In Michigan, common loons are now known to breed only in the Upper Peninsula and the very northern portions of the Lower Peninsula. Only a few isolated pairs remain in the southern portions of the Lower Peninsula. However, even in the north, there are not enough birds to fill the available habitat. Only 50 percent of the “highly suitable breeding lakes” are currently being used in the northern two-thirds of the state. Easily disturbed and stressed, adult common loons may desert their nest if approached too closely by a person, boat or other water vehicle, or wake from such a vehicle. Besides disturbance from humans and boats, there are several other factors which may have contributed to the decrease of common loons in Michigan: accumulations of poisons such as mercury can cause decreases in productivity; Type E Botulism has been known to kill loons; increases in raccoon and herring gull populations have meant increases in egg and chick mortality; pesticides have caused thinning of egg shells; water level changes caused by hydroelectric dams, or storms can affect nesting sites; fishing nets and oil spills encountered during winter migrations can be devastating; and lead poisoning from ingestion of fishing tackle is also a known cause of death. The common loon was listed as a Michigan state threatened species in 1987, and consequently a recovery plan was created. Recommendations include protection of current and potential breeding lakes, reduction of causes of mortality, and public educational programs. However, everyone in Michigan can help to protect and foster our common loon population by remembering to give them the seclusion they need, and letting others know if there is a nest nearby so that it can be avoided. CHECK THESE LINKS TO LEARN MORE!